National Park Nechkinsky, in Votkinsky, Zavyalovsky and Sarapulsky Districts of the Republic of Udmurtia, was established in 1597. Its area is 20,7 thousand ha. It is located in the middle part of the Kama River valley and on the shore of the Votkinskoye Reservoir on the watershed of the Siva River, Kama tributary, and the Reservoir. The depth of the incised valley is 100-160 m; width, 3 to 20 km. A sharp asymmetry of the valley slopes is characteristic: the left shore being fairly flat; and the right is steep. 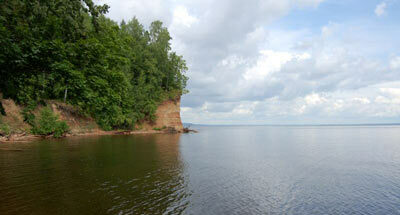 The width of the Kama river channel is about 1 km. The Kama wide floodplain is well-defined; often has crescent lakes and swamps, and there are pronounced above-floodplain fluvial terraces (from two to four levels). The plant cover comprises complexes of taiga, mixed forests and steppe-forests. 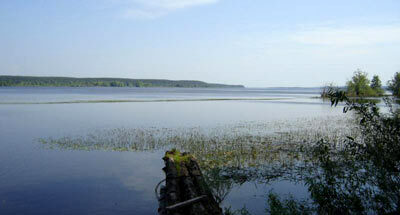 The most valuable nature communities are found on the left bank of the Nechkinka River. There are old pine forests. Oligotrophic and mesotrophic bogs are numerous. 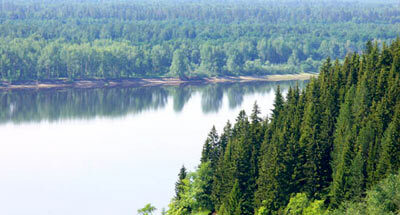 The most notable nature monument landscape sites are as follows: Sidorovy Gory, Galevo, the mouth of the Siva River, the Kemulskoye bog (2 thousand ha), mineral water spring Makarovsky. In the Kama River valley some archeological monuments are located. The town Votkinsk is associated with the name of P.I. Chaikovsky.